Grab your customer’s attention and lead them into your business with a bright, powerful LED sign from National Signs. Let them know about your contribution to a greener environment with the energy savings of an LED sign. LED technology can be used in a variety of interior and exterior signage including channel letters, reverse channel letters, pylon and monuments signs. LED lighting can also be used to simulate neon. Utilizing LED technology is highly efficient and effective. LEDs not only last a lot longer, they require less maintenance and utilize a fraction of the electricity. 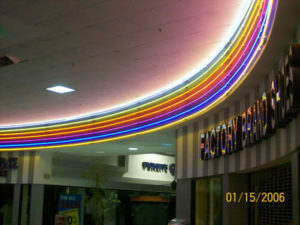 National Signs is an industry leader in LED technology. Let us show you the benefits of a new LED sign. National Signs can retrofit and refurbish your old sign and make it better than new utilizing LED technology!